It’s back to school today for all my guy, gal and ghoulfriends, which makes me think of Zombie High and R. L. Stine. Robert Lawrence “Jovial Bob” Stine is the American writer responsible for giving kids goosebumps in the series of the same name. In addition to Goosebumps, Rotten School, Mostly Ghostly, The Nightmare Room and Fear Street series, he produced a TV series and two video games: Escape From Horrorland and Attack of the Mutant. Kreepy kids who have a hankering for a play-date with horror love his books. I call them fiendishly funny. 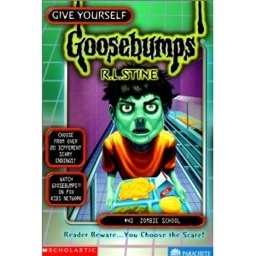 So those who devour scary stories might want to include an R. L. Stine sandwich, fresh from the local library or bookstore, in their school lunches. Nothing like a little horror-induced adrenaline to get the mind going…my favorites are Edgar Allen Poe and Stephen King. I'll have to check out the Goosebumps series and measure the adrenaline levels!